In a time when popular music is dominated by synths, samples, and autotune, many music fans have become wistful for the humanistic sounds of organic instruments. Just as some think the last string has been strummed, an eclectic concoction of raw roots, punk, psychedelia, and vaudeville has been brewing up in the Northeast city of Portsmouth, New Hampshire. 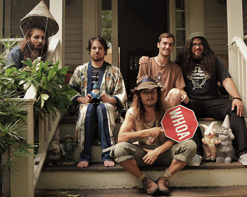 In their new single, “Why Say Why?”, freak-folk traveling circus band People Like You encourage the listener to live life to the fullest because you never know when it will come to an end. People Like You is the brainchild of singer/songwriters Eli Elkus and Andrew Polakow. With the musical prowess of Justin Sheriff, Rob Littlefield, and Max Elkus rounding out the lineup, these rabble-rousers are an awe-inspiring sight to see in a live setting. In fact, attendees at a PLY show aren’t just treated to watching live music; they become a part of the band itself as old-school barroom dancing is guaranteed. Whether it’s a backyard, bar, or club, the band makes it known that it’s a family affair, and their show is your induction into the People Like You clan. We’re profoundly thrilled to share the organic sounds and honest humility of People Like You to bring you the “Why Say Why?” music video. These guys truly put the “show” back in “show business” and it’s our sincere hope that you and your viewers will embrace the “Why Say Why?” music video, share it on your socials, and add it to your programming in a timely fashion. Rest assured we will have plenty of outstanding People Like You merch to set up online/on-air contests and giveaways throughout the campaign and we strongly urge you to join this compelling musical carnival! Please contact Andy Gesner and the HIP Video Promo team at (732)-613-1779, email us at info@HIPVideoPromo.com. You can also visit www.PeopleLikeYouBand.com for more info on People Like You.